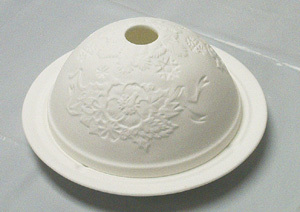 Beautiful tealight candleholder made from porcelain bisque. This lithophane will brighten any setting. Approximately 5" diameter bottom plate with a dome that is 2" tall. There is a very nice floral design on the dome. Beautiful tealight candleholder made by Moga Porcelain Manufacturers. This lithophane/wax burner will brighten any setting. It also has a highly polished dish on the top to melt your wax potpourri. Approximately 6" tall it has a beautiful winter scene on the front with cut outs for the house windows, stars and moon. This is a beautiful handmade and handpainted porcelain lamp from Moga Porcelain Manufacturers. The top globe is about 4" in diameter and emits a soft glow when lit. The entire lamp stands about 9" tall. This lamp is sold without the wiring so it may be used as a tealight or votive candleholder if desired. This vase stands 5" tall and has a wonderful design. 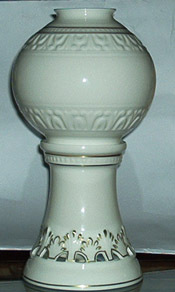 The vase is handmade in Romania with the artists signature on the base. Visit Us At eBay !